Blarina brevicauda, or the short-tailed shrew is one apparent enemy of the Upland Pillsnail, according to J.A. Allen in Natural Enemies of Terrestrial Molluscs (Barker 2004). Other land snails, small mammals, such as shrews and mice, wild turkey and grouse, and salamanders are the main predators of Euchemotrema fraternum. Examples of these predators would be the Gray-footed Lancetooth terrestrial snail and the Scaphinotus Ground Beetle (Dourson 2006). 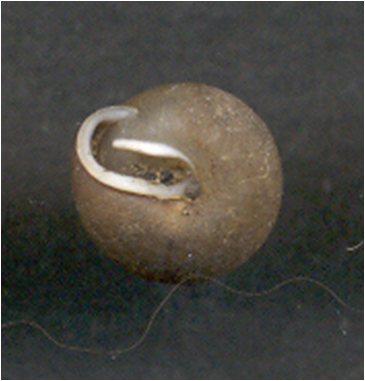 Another example and one species of land snail, Oxychilus draparnaudi, prefers the Upland Pillsnail, even over usually-favored plant material (Barker 2004). Shells of the Upland Pillsnail, as well as other terrestrial mollusks, are an important Calcium source for birds. Factors that influence the size of the terrestrial mollusk population often have a direct correlation to the survival and population of some species of bird young (Dourson 2006). Overpopulation and immigration of exotic species is another, often-harmful, interaction that the Upland Pillsnail participates in. The expansion of exotic terrestrial mollusk species causes several issues for the native terrestrial mollusks. These issues are anything from limiting the food source to bringing into the environment new, fatal diseases that the native mollusks are not immune to. This introduction of new diseases can also be caused by the movement of exotic earthworms into the habitat of the Upland Pillsnail. The overpopulation of deer has also been known to have a negative effect on the populations of terrestrial mollusks (Dourson 2006). To learn more about the habitat of Euchemotrema fraternum visit the Geography/Habitat page. Rock climbing also has a very negative effect on the Upland Pillsnail. This is outlined in the study, " Effects of Rock Climbing on the Land Snail Community of the Niagara Escarpment in Southern Ontario, Canada." They took samples of snail populations from "climbed" and "unclimbed" areas. The results were dictated through unanimous evidence: shell density was over five times greater in "unclimbed" areas, species diversity was significantly lower on "climbed" areas, and two times more species were present in "unclimbed" areas. In their Discussion section the authors dictated how important land snails like Euchemotrema fraternum are to the ecosystem in "processing energy and matter at high rates" and how rock-climbing is almost certainly having a negative effect on the terrestrial snails studied (McMillan, et al. 2003).